Out in the country lay an old manor house, and in it lived an old squire who had two sons who were twice as clever as they had any right to be. They were going to propose to the daughter of the king, and they weren’t afraid to do that because she had announced that she was going to marry whoever could talk best. They spent eight days preparing themselves, that was all the time they had, but they knew a lot of things beforehand, and that’s always useful. One of them knew the whole Latin dictionary by heart and the town newspaper for three years both forward and backward: the other had acquainted himself with the laws of all the guilds and that every alderman should know, then he could talk about state affairs, he thought: and besides that he could embroider suspenders, for he had a very delicate touch. “I’ll get the Princess!” both of them said, and then their father gave each of them a lovely horse. The one who knew the dictionary and the newspapers got a coal-black horse, and he who knew about guilds and embroidery got a milk-white one, and then they rubbed the corners of their mouths with fish oil to make them more supple. All the servants were down in the yard to see them get on their horses, and just then the third brother came. There were three, but nobody counted him as a brother, because he wasn’t such a scholar as the other two, and so they just called him Dull Jack. “Where are you going, all dressed up like that?” he asked. “To the court, to get the Princess by talking! Haven’t you heard what they are drumming about all through the country?” And they told him about it. “Good gracious, I’d better go, too, then!” said Dull Jack, and his brothers laughed at him and rode away. 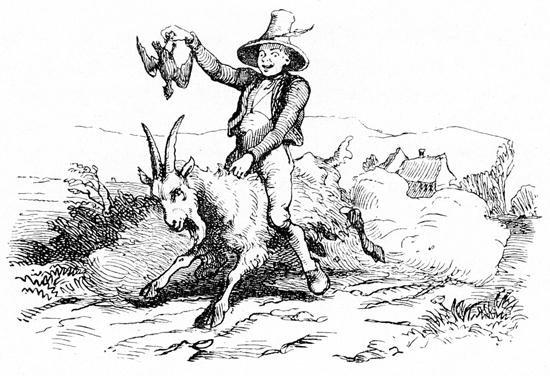 “If I can’t have a horse,” said Dull Jack, “then I’ll take the goat, that’s my own and it carries me very well!” And then he sat astride the goat, kicked his heels into its sides, and rushed away along the highroad. Whee! what speed! “Here I come!” said Dull Jack, and sang till the noise went trailing after him. But the brothers were riding ahead very quietly: they weren’t saying a word: they were thinking up all the good ideas they were going to have: everything was going to be very clever. “Hey, there, hello!” Dull Jack shouted, “Here I come! Look what I found on the road!” and then he showed them a dead crow he had found. “Oh, yes, do give it to her,” they said and laughed, and rode on. “She is!” said Dull Jack, and the brothers laughed and they rode on and they got far ahead. “What have you found now?” asked the brothers. “That’s what it is!” said Dull Jack, ” and it’s the very finest kind, you can hardly keep hold of it!” and then he filled his pockets with it. But the brothers rode on as fast as the horses could go, and they got there a whole hour ahead of him, and they stopped at the city gate, and there every suitor was given a number, and they were all stood in line, six in every row and so close that they couldn’t move an arm. That was a good thing, too, or they would have stabbed each other in the back just because one stood in front of the other. 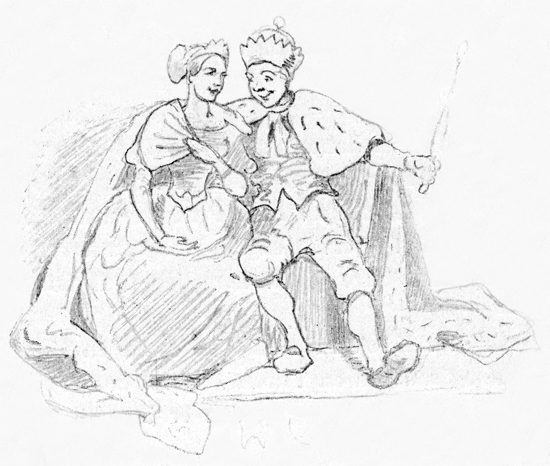 All the rest of the country’s inhabitants were standing around the castle right up against the windows to watch the Princess receive the suitors, and as each of them came into the room the power of speech departed from him. Now the brother came who knew the dictionary, but he had clean forgotten it by standing in line, and the floor creaked, and the ceiling was made of mirror glass, so that he saw himself standing on his head: and three clerks and an alderman stood at every window and wrote down everything that was said so that it could be put right in the newspaper and be sold for two cents on the corner. It was terrible, and the stove was so hot that the chimney was all red. “It is very hot in here,” said the suitor. “That’s because my father is roasting chickens today!” said the Princess. Boo! there he stood: he hadn’t expected that kind of speech: and he hadn’t a word to say just when he wanted to say something funny. Boo! “No good!” said the Princess. “Get out!” And then he had to get out. Now the second brother came. “It’s terribly hot in here,” he said. “Yes, we’re roasting chickens to-day!” said the Princess. Then Dull Jack came: he rode on the goat right into the room. “It’s burning hot in here!” he said. “That’s because I’m roasting chickens!” said the Princess. “But I have!” said Dull Jack. “Here’s a pot with tin nails!” and then he pulled the old wooden shoe out and put the crow right in it. “I have that in my pocket!” said Dull Jack. “I have such a lot I can throw some of it away!” and then he poured a little mud out of his pocket. “That’s what I like,” said the Princess, “you can answer, and you can talk, and you’re the man I want to marry! But do you know that every word we’re saying and have said is written down and put in tomorrow’s newspaper? You see there are three clerks and an alderman standing by every window, and the alderman is the worst because he can’t understand!” and she said that to scare him. And all the clerks guffawed and dropped ink on the floor. “Ah, so there we have the upper class?” said Dull Jack, “then the alderman will have to have the best,” and then he turned his pockets inside out and threw the mud right into his face. And then Dull Jack was king, and had a wife and a crown and sat on a throne, and we got that right out of the alderman’s newspaper – and you can’t depend on that.